Africa was more industrialized in the 1970s, at a time when the business climate was likely no different from what it is today. In my opinion, the Structural Adjustment Policies (SAPs) that were administered beginning in the early 1980s are largely responsible for halting the pace of industrialization on the continent. With SAPs, Africans were told by their betters to stop supporting industry because doing so was “wasteful”. Subsidies to industry were reduced. Protective trade barriers were removed. Planning for industry was done away with. All this advice was dispensed in spite of the fact that today’s developed countries industrialized behind a veil of considerable state support. For instance, the historian Sven Beckert points out that Britain’s cloth manufacturing industry, which was largely responsible for the Industrial Revolution, was shielded from competition from India for most of the 18thCentury. The Cambridge economist Ha-Joon Chang has called this phenomenon of rich countries forcing policies on poor countries that they themselves did not implement during their time of take-off as “kicking away the ladder”. The manufacturing sector has long been viewed as the main economic engine for industrialization. Unlike the primary sector, it provides well-paying jobs, skills transfers (positive spill-overs) and leads to economic development, as was the case in the West, Asian Tiger economies, and today’s China. At the heart of this economic transformation debate is the extent of government’s role. Some argue that good (inclusive) institutions create a climate that promotes innovation and leads to economic ascension. Others, including Chelwa, argue that an activist government plays an important role by fostering industrialization. …falls short of persuading. Perhaps the biggest disappointment is Chang’s extremely superficial treatment of the historical experience of the now developed countries. He has simply chosen not to engage the work of economic historians on the questions he is raising. For example, chapter one — “How Did the Rich Countries Really Become Rich?” — does not contend with the work that economics historians have done on the topic. Given the broad question posed in this chapter, one might have expected Chang to confront such landmark works as Douglass North and Robert Thomas’s The Rise of the Western World (1973) or Nathan Rosenberg’s and L.E. Birdzell’s How the West Grew Rich: The Economic Transformation of the Industrial World (1986). These works stress the importance of political systems that provide security to economic transactions and economic systems that allow for competition, broadly construed. But Chang does not explain why the lessons from these works are not relevant to developing countries today. The import substitution strategy was in general strongly biased against exports. The limited local demand slowed the IS drive while initial efforts to shift to export promotion were constrained by structural rigidities, low productivity and macroeconomic instability. In addition, the protection strategy reduced competition within the domestic industry, making industries act as monopolies, reaping high profits while operating at low capacity utilization and raising prices to consumers. Too often, developing-country policy-makers have tried to take a short cut in this endogenous process of industrial and technological upgrading. They have fixed their sights and their policies on an ideal industrial structure that they associate with modernisation, but that structure is of course usually capital- and skill-intensive and is characteristic of a higher-income country than their own. As I have argued in my Marshall Lectures (Lin, 2009), industrial strategies of the often newly-independent developing countries in the 1950s and 1960s were informed by incorrect perceptions of the binding constraints on development. These countries adopted development strategies that placed a priority on capital-intensive heavy industries, that is, industries that made intensive use of a factor that they largely lacked, and that neglected to use many of the factors that they had in great abundance, such as unskilled labour and natural resources. In effect, these policy-makers took the optimal industrial structure as something that they could impose exogenously, rather than something that results from the characteristics of the economy and changes over time. Chelwa blames the World Bank and International Monetary Fund (IMF)’s Structural Adjustment Programs (SAPs) for Africa’s so-called de-industrialization. Yes, SAPs were wrongheaded policy prescriptions, because they assumed that African countries faced similar problems and were more or less on the same (development) level. In addition, these Bretton Woods institutions assumed that African leaders will do the right thing (i.e. not embezzle loans). However, in my opinion, Africa’s de-industriliazation is mostly due to China’s entry into the world market. With its comparative advantage in low-skilled and inexpensive labor, Chinese imports have impacted rich and developing countries alike. 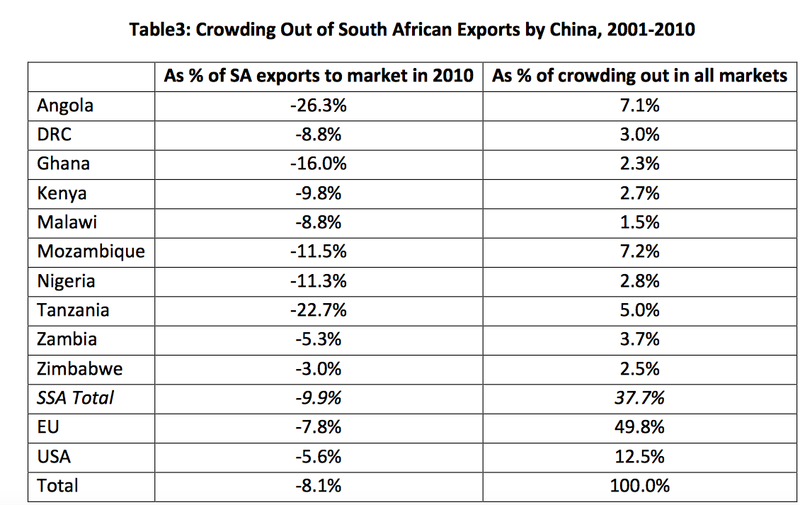 The table below from a paper titled “Is China “crowding out” South African exports of manufactures” clearly shows that China’s rise has affected African manufacturing sector, especially South Africa’s. As the continent’s main manufacturing powerhouse, Pretoria dominated Africa’s manufacturing imports. The Rainbow nation has lost its market share in the continent, especially after China joined the World Trade Organization in 2001.